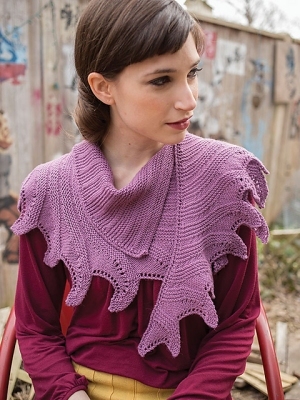 Taken from Berroco - Cosma: "An asymmetric shawlette worked from end to end, with a dramatic edging worked as you go." This pattern is from Berroco - Cosma, pg 9 - Dabotap. Size US 5 straight needles (or size needed to obtain gauge) are required but not included. Finished Measurements: 23" x 40" after blocking. Gauge: 23 sts and 30 rows over 4".